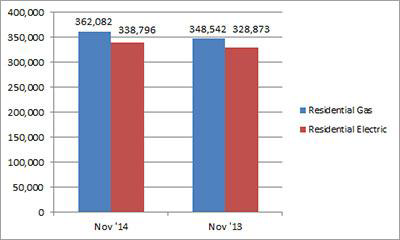 U.S. shipments of residential gas storage water heaters for November 2014 increased 3.9 percent, to 362,082 units, up from 348,542 units shipped in November 2013. 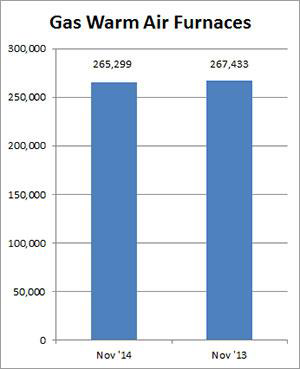 Residential electric storage water heater shipments increased 3.0 percent in November 2014, to 338,796 units, up from 328,873 units shipped in November 2013. For the year-to-date, U.S. shipments of residential gas storage water heaters increased 3.7 percent, to 4,026,183, compared to 3,884,045 units shipped during the same period in 2013. Residential electric storage water heater shipments increased 5.5 percent year-to-date, to 3,860,772 units, compared to 3,659,606 units shipped during the same period in 2013. Commercial gas storage water heater shipments increased 19.9 percent in November 2014, to 7,169 units, up from 5,979 units shipped in November 2013. 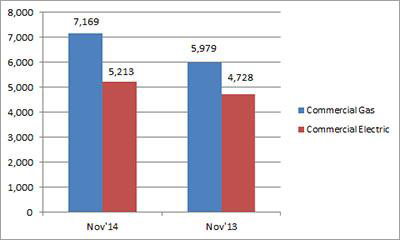 Commercial electric storage water heater shipments increased 10.3 percent in November 2014, to 5,213 units, up from 4,728 units shipped in November 2013. Year-to-date U.S. shipments of commercial gas storage water heaters increased 6.6 percent, to 86,113 units, compared with 80,744 units shipped during the same period in 2013. Year-to-date commercial electric storage water heater shipments increased 6.6 percent to 67,189 units, up from 63,048 units shipped during the same period in 2013. 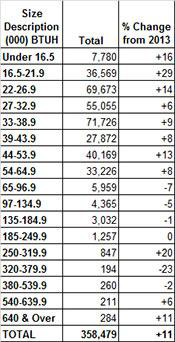 U.S. shipments of gas warm air furnaces for November 2014 decreased 0.8 percent, to 265,299 units, down from 267,433 units shipped in November 2013. 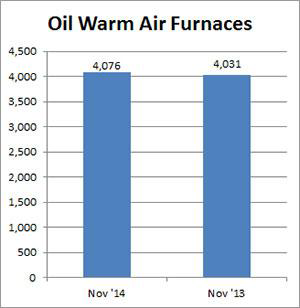 Oil warm air furnace shipments increased 1.1 percent, to 4,076 units in November 2014, up from 4,031 units shipped in November 2013. Year-to-date U.S. shipments of gas warm air furnaces increased 4.5 percent, to 2,468,626 units, compared with 2,361,322 units shipped during the same period in 2013. Year-to-date U.S. shipments of oil warm air furnaces increased 6.9 percent to 30,611, compared with 28,624 units shipped during the same period in 2013. U.S. shipments of central air conditioners and air-source heat pumps totaled 358,479 units in November 2014, up 10.9 percent from 323,185 units shipped in November 2013. 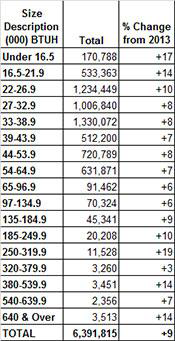 U.S. shipments of air conditioners increased 9.9 percent, to 227,523 units, up from 207,057 units shipped in November 2013. U.S. shipments of air-source heat pumps increased 12.8 percent, to 130,956 units, up from 116,128 units shipped in November 2013. 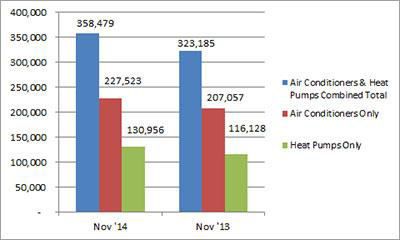 Year-to-date combined shipments of central air conditioners and air-source heat pumps increased 9.0 percent, to 6,391,815 units, up from 5,863,559 units shipped in November 2013. Year-to-date shipments of central air conditioners increased 5.1 percent, to 4,221,291 units, up from 4,014,584 units shipped during the same period in 2013. The year-to-date total for heat pump shipments increased 17.4 percent, to 2,170,524 units, up from 1,848,975 units shipped during the same period in 2013.